Polyurethane-93. 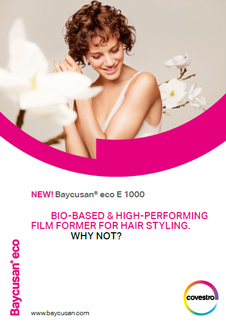 Baycusan® eco E 1000 by Covestro is a bio-based film-forming polyurethane (PU) dispersion for hairstyling products. As compared to synthetic acrylate polymers, it achieves the optimum performance as well as offers good humidity resistance. 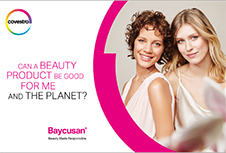 It is based on renewable resources with a carbon content based on 58% biomass. 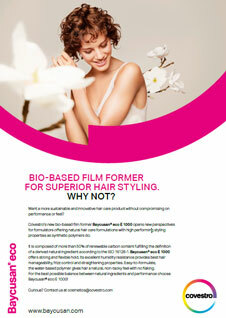 It provides good long-lasting, and flexible hold while offering anti-frizzing properties. Other advantages include straightening, heat protection, conditioning, non-tackiness and low flaking. 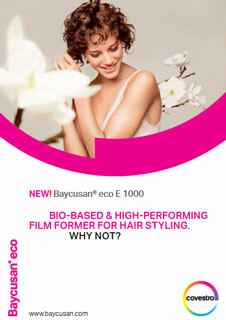 Baycusan® eco E 1000 is recommended for use in hair styling products.